All that talk about hash browns and no recipe? That's just silly. Here's my own spin on Tyler Florence's hash brown recipe. Hash Browns 1 1/2 pounds russet potatoes 1 cup bacon, chopped 1 medium shallot, sliced 1 egg white 4 green onions salt and pepper 1/2 cup cheddar cheese, shredded kosher salt and freshly ground black pepper extra virgin olive oil 1. Peel potatoes and finely shred them any way you want (food processor with shredder attachment, a box grater, potato ricer or with a knife) 2. Place the potatoes in a bowl of cold water to rinse, then place in kitchen towel and thoroughly squeeze out all the moisture. They won't get crisp if they still have moisture in them. 3. In a large pan over low heat (preferably a cast iron) place chopped bacon and shallots. Let cook for 10-15 minutes until shallots have caramelized and bacon is almost cooked through. 4. 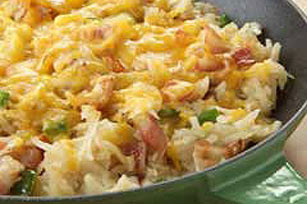 In a large bowl mix potato shreds, bacon, caramelized shallots, egg white, green onions and cheddar cheese. Mix with hands. 5. Spoon in potato mixture to the same pan used for the bacon. Pat the potatoes into place, and top with a little olive oil and salt and pepper. Let it cook on medium heat until you can tell the potato has started to separate from the bottom (don't force it.) Once you can shake the potato cake loose, flip to the other side and cook for 7ish more minutes. 6. Serve with ketchup. mmmmm.